Speed limit to be raised to 80mph | What Car? The Government is expected to announce plans to raise the national speed limit to 80mph. The Guardian is reporting that transport secretary Philip Hammond will make the announcement at the Conservative Party conference in Manchester this weekend. It is also thought that the Government will increase the number of 20mph zones in built-up areas. The changes, just for motorways in England and Wales, are expected to be introduced from 2013 following a consultation period. 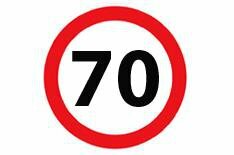 The current national speed limit of 70mph has been in place since the 1960s. Speed limits in Northern Ireland and Scotland are set by the devolved governments.